Sew Slowly: A new dawn, a new day, a new project. So...this month I am planning to try two new things: free piecing a la quiltdivajulie and applique as expounded in Lara's new book. Saturday, May 28 - Monday, May 30 ... Memorial Day Weekend in the U.S. There's a chance to win the Crafted Applique book every day, and there have been so cool posts so far, so if you haven't already, do go and check out the other participants. I'm excited that you are going to give free piecing a whirl -- can't wait to see what you create! I like your first pull of possibilities! A great blend of colours, prints and solids! I am intrigued to see what you will be making for Lara's blog hop. The fabric pulls look very enticing. 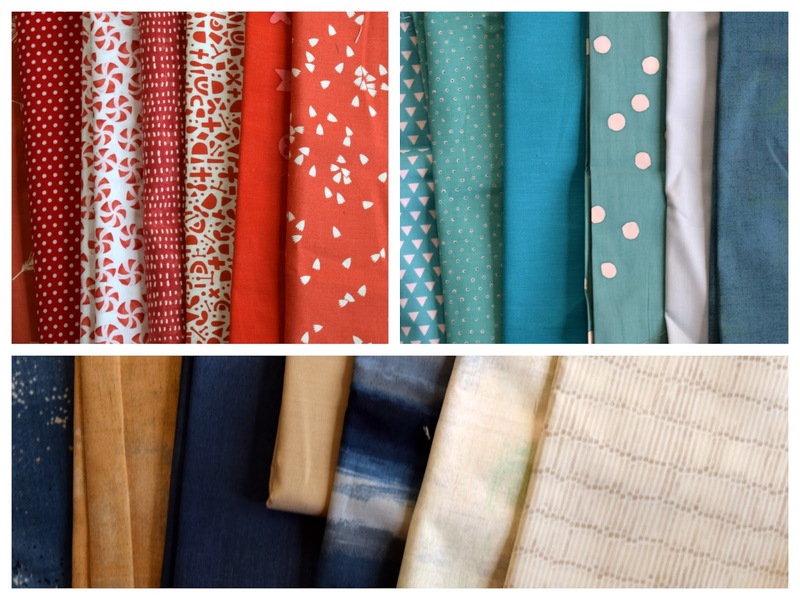 Exciting news - look forward to what you come up with from those lovely fabrics. I am going to be working on a barn this month, just gathering fabrics - from my stash I hasten to add. Oh, I am loving this tour and excited to see what you create! Kaja, whatever you do with both Julie's free piecing and my Crafted applique, one thing I know for sure - It's going to be both fun and inspiring to watch you work it out! I'm going to try to Build Barn too, as soon as things settle down a little. Loved Julie's book! Looking forward to both of these projects. I really like your fabric pull. The applique blog hop has been so much fun so far, and I'm sure you'll have something wonderful to share! I like the way you grouped these fabrics. And I note you have included reds! Looking forward to this.